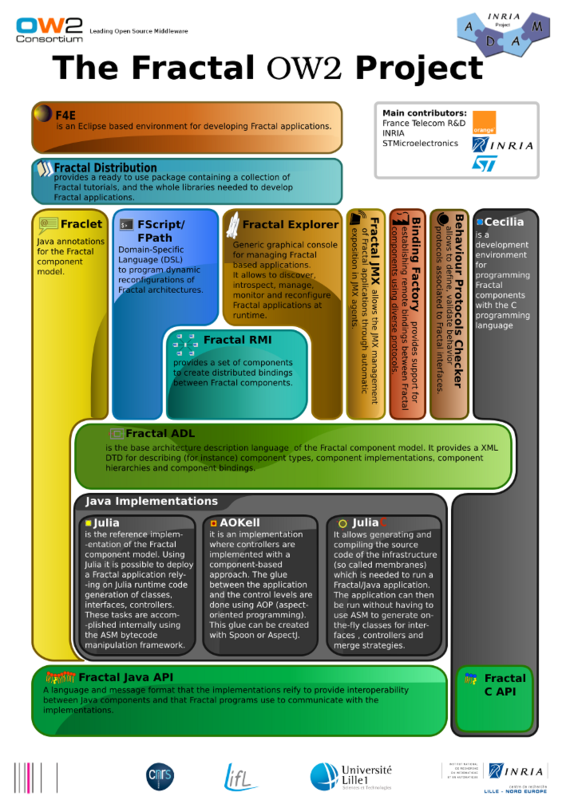 Fractal is a modular and extensible component model that can be used with various programming languages to design, implement, deploy and reconfigure various systems and applications, from operating systems to middleware platforms and to graphical user interfaces. 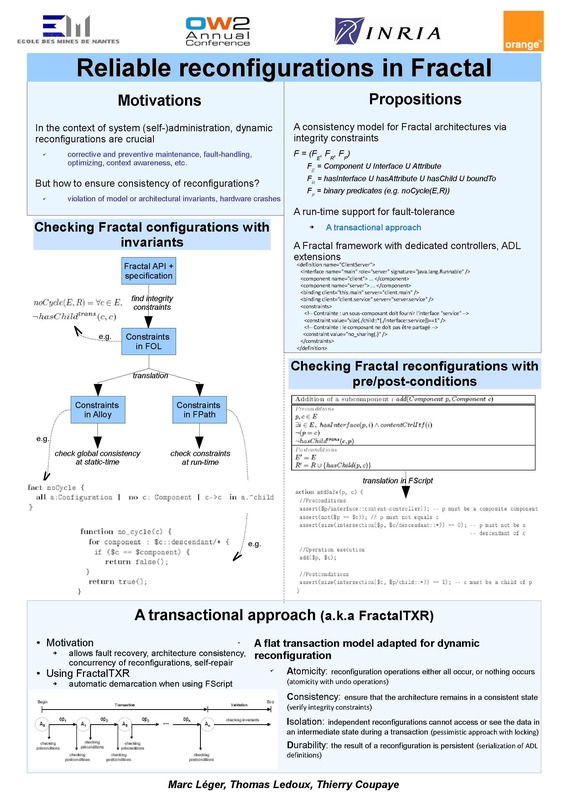 Fractal is also a project with several sub projects, dealing with the definition of the model, its implementations, and the implementation of reusable components and tools on top of it. The Fractal component model heavily uses the separation of concerns design principle. The idea of this principle is to separate into distinct pieces of code or runtime entities the various concerns or aspects of an application: implementing the service provided by the application, but also making the application configurable, secure, available, ... In particular, the Fractal component model uses three specific cases of the separation of concerns principle: namely separation of interface and implementation , component oriented programming , and inversion of control . The first pattern, also called the bridge pattern, corresponds to the separation of the design and implementation concerns. The second pattern corresponds to the separation of the implementation concern into several composable, smaller concerns, implemented in well separated entities called components. The last pattern corresponds to the separation of the functional and configuration concerns: instead of finding and configuring themselves the components and resources they need, Fractal components are configured and deployed by an external, separated entity. The separation of concerns principle is also applied to the structure of the Fractal components. A Fractal component is indeed composed of two parts: a content that manages the functional concerns, and a membrane of controllers, that manages zero or more non functional concerns (introspection, configuration, security, transactions, ....). The content is made of other Fractal components, i.e. Fractal components can be nested at arbitrary levels (Fractal components can also be shared , i.e. be nested in several components at the same time). The introspection and configuration interfaces that can be provided by the controllers allow components to be deployed and reconfigured dynamically. These control interfaces can be used either programmatically, or through tools based on them, such as deployment or supervision tools. 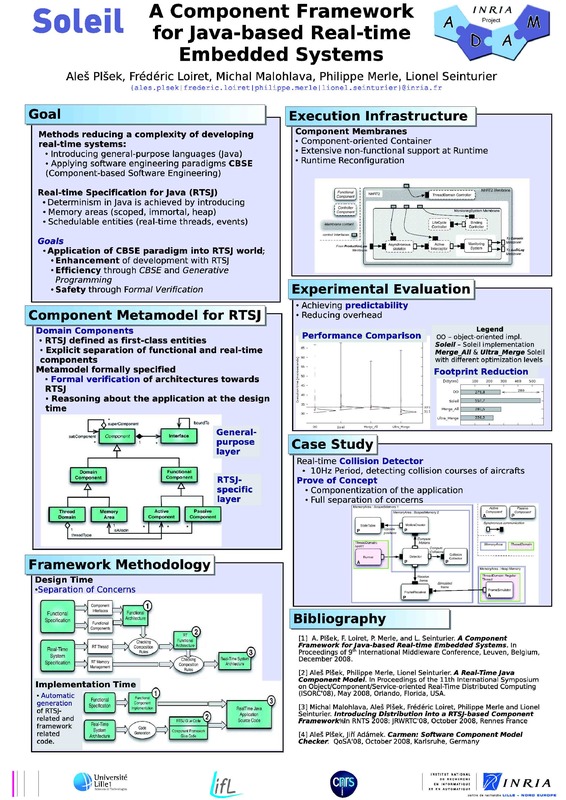 The specification of the Fractal component model is presented in the The Fractal Component Model document. In addition, the Fractal ADL web page contains information about the Fractal Architecture Description Language. Special issue of the Annals of Telecommunications on Component-Based Architecture: The Fractal Initiative. January-February 2009. P. Merle, and J.-B. Stefani. A Formal Specification of the Fractal Component Model in Alloy . 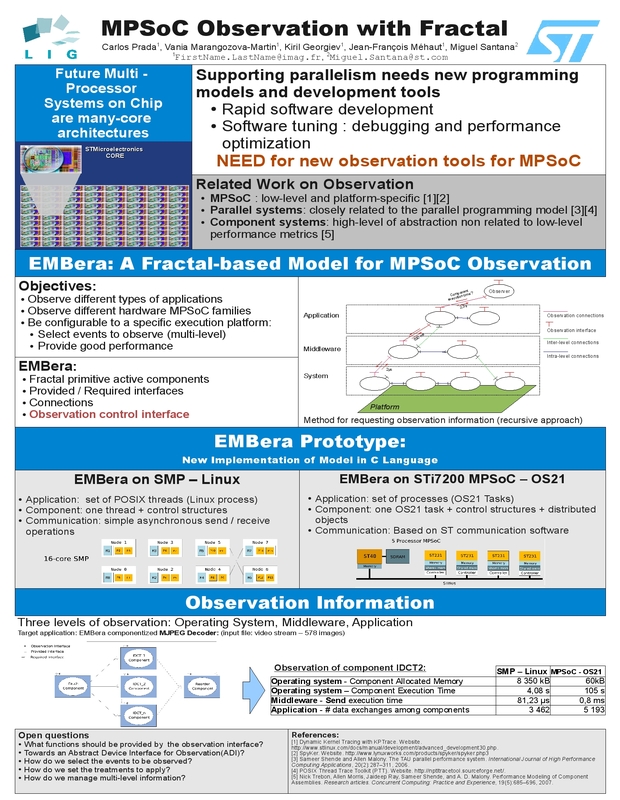 INRIA Research Report 6721. November 2008. Y. Davin. A la découverte du modèle de composants Fractal . Revue Programmez!. Numéro 123. Septembre 2009. T. Coupaye, V. Quéma, L. Seinturier, J.-B. Stefani. Le système de composants Fractal. Chapitre 3 de Intergiciel et Construction d'Applications Réparties. Janvier 2007. OW2 Webinars. April 7, April 21, May 5, 2009. Fractal lecture at ECOOP 2006. July 4, 2006. Fractal lecture at 3rd LAFMI summer school on distributed systems, UDLA, Puebla, Mexico, August 16-20, 2004. Fractal course and lab exercices at the University of Grenoble. Fractal tutorial at ICAR 2008, 2006, 2003. 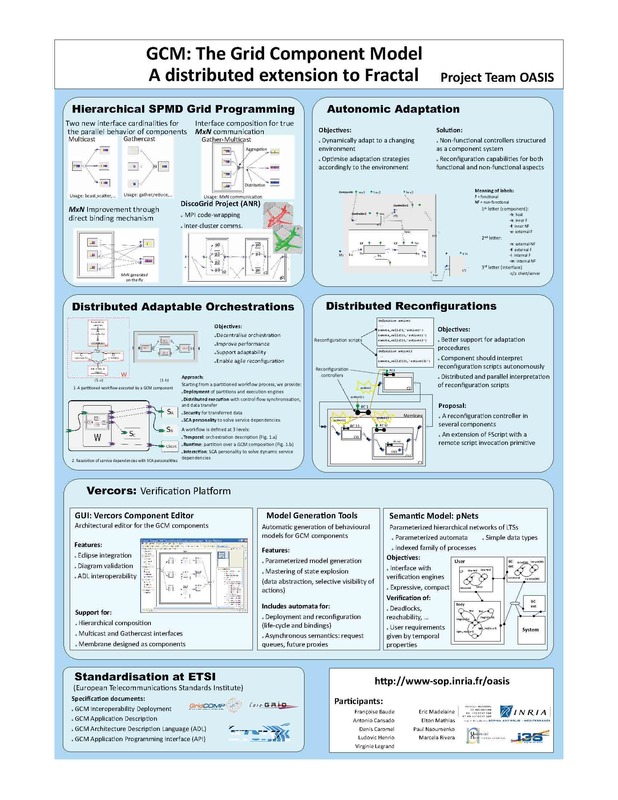 Slides, lab exercices, software package (based on Fractal Distribution). Poster session at the 2009 OW2 Annual Conference. April 2, 2009. Paris, France. 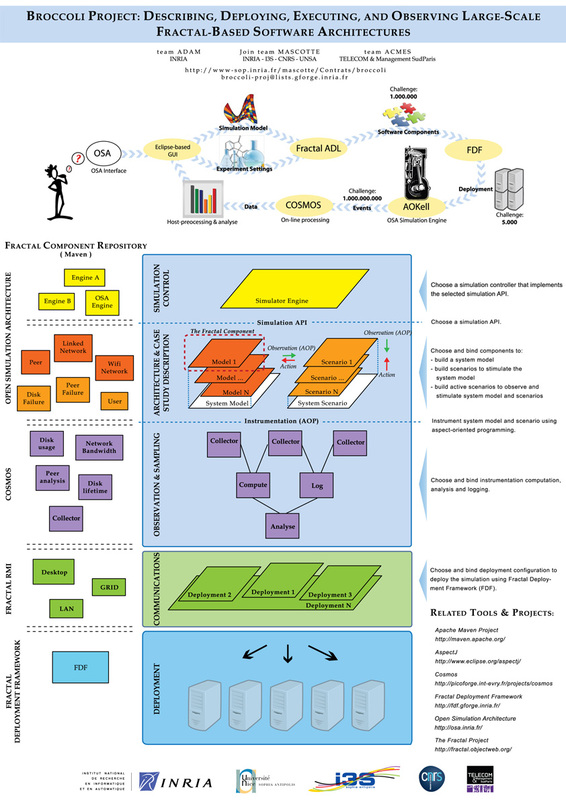 Broccoli Project: Describing, Deploying, Executing, and Observing Large-Scale Fractal-Based Software Architecture. J. Ribault and the INRIA Broccoli ARC. Grid Component Model - GCM. L. Henrio and the OASIS INRIA Project-Team. 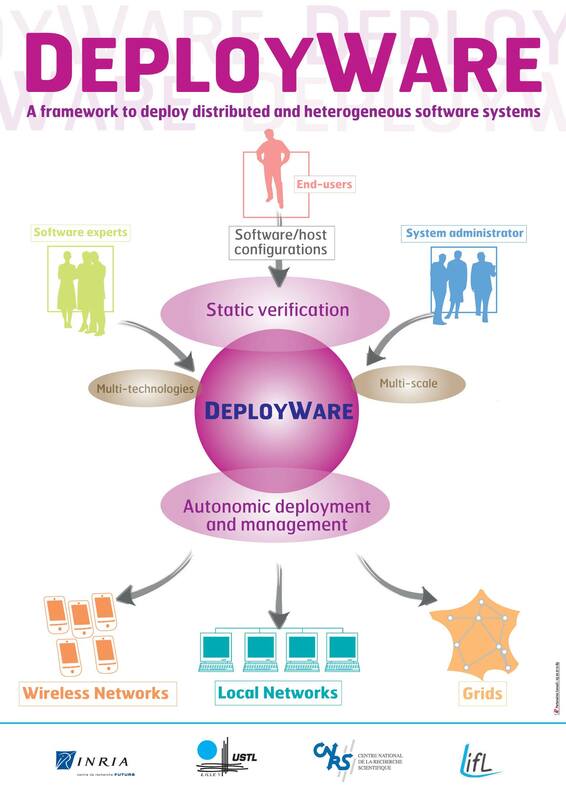 DeployWare. P. Merle, Y. Davin. The Fractal OW2 Project. Y. Davin and the Fractal OW2 Development Team. 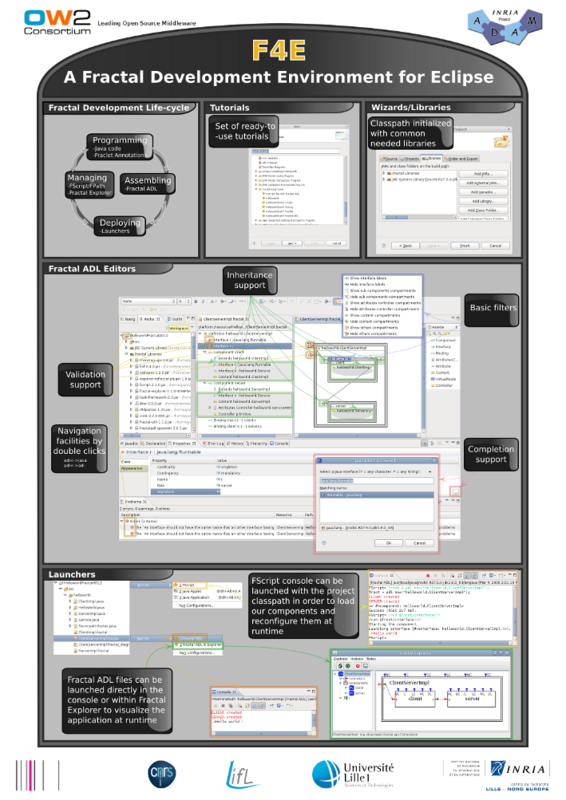 F4E: A Fractal Development Environment for Eclipse. Y. Davin. 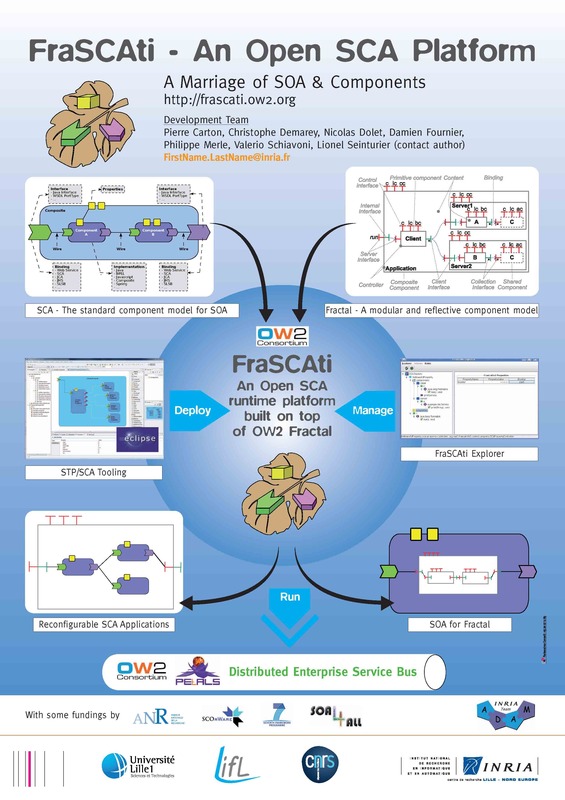 FraSCAti - An Open SCA Platform. P. Carton, C. Demarey, N. Dolet, D. Fournier, P. Merle, V. Schiavoni, L. Seinturier. Soleil - A Component Framework for Java-based Real-time Embedded Systems. A. Plsek, F. Loiret, M. Malholava, P. Merle, L. Seinturier. Reliable Reconfigugations in Fractal. M. Léger, T. Ledoux, T. Coupaye. MPSoC Observation with Fractal. C. Prada, V. Marangozova-Martin, K. Georgiev, J.-F. Méhaut, M. Santana. 5th Fractal workshop at ECOOP 2006. July 3, 2006. Nantes, France. 4th Fractal workshop at Middleware 2005. November 28, 2005. Grenoble, France. 3rd Fractal workshop at the June 2005 ObjectWeb meeting. June 21, 2005. Grenoble, France. 2nd Fractal workshop at the March 2004 ObjectWeb Architecture meeting. March 25, 2004. Grenoble, France. 1st Fractal workshop . January 29, 2003. Grenoble, France. Questions, comments, ideas, etc. related to Fractal can be posted on the Fractal mailing list.